After being hosted at Alton Towers and the East of England Showground in Peterborough, the UK Coach Rally is going back to its seaside roots for its 62nd incarnation. Its new Blackpool location sees it return to the coast for the first time since the final Brighton event in 2009. Whether it’s the new location or simply renewed interest, competitors have certainly been drawn to the Rally, which is fully booked with 50 entries. Undeniably, Parrys International have dominated the winning spot in the Coach of the Year title at recent Rallies. That was certainly the case for 2015’s event when it took the title with one of its Neoplan Starliner 2s, a similar vehicle having taken the title in the previous year. Will a new winner topple the current champion? You can find out as the results are announced if you attend the Rally, which takes place on the weekend of 23 and 24 April. 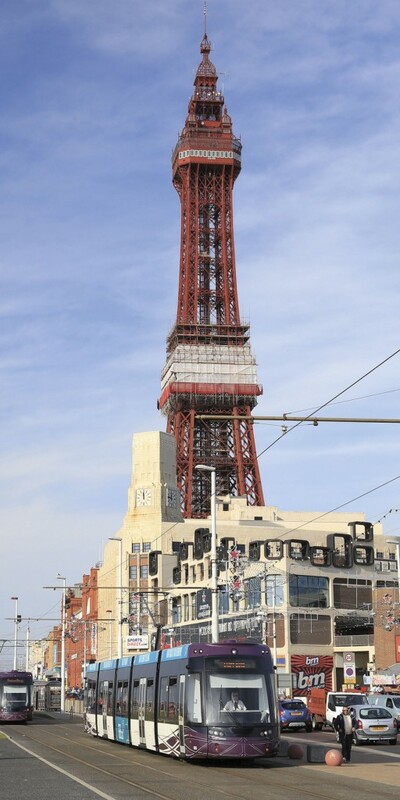 Hosted by the Merlin Entertainments Group and Visit Blackpool, it will be held on the promenade by Blackpool Tower. There will of course be the traditional evening Dinner and Dance, which this year takes place at the Blackpool Tower Ballroom. 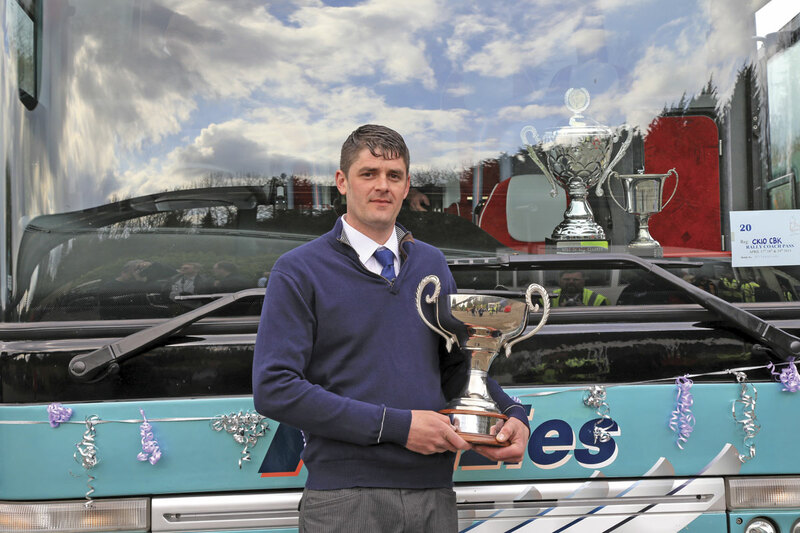 It is not just the top coach being recognised at the Rally, there is also the Coach Driver of the Year, which last time went to Darren Stanford of Kenzies Coaches Ltd. This competition is designed to test the skills of the industry professionals involved, as will the traditional road run early on the Saturday morning. In addition to the 50 competing entries, the trade stands aren’t to be missed at the Rally either with most of the UK’s popular coach marques and dealers represented. In attendance will be the whole sales team from Pelican Bus and Coach, headed now by Bob Elliott. The Castleford based dealership will be bringing a Yutong TC9 Euro6 touring coach. Powered by a Cummins ISB6.7 engine delivering 280hp coupled to a ZF 6AP1200B automatic gearbox, it has 35 seats, an Alpine multimedia package, a roof mounted air conditioning system and a fridge. A Yutong TC12 is due to be brought to the Rally by one of Pelican’s customers. Arriva Bus and Coach Ltd will be bringing two Van Hools to the Rally. One is the EX16H with 57 Kiel Avance 2010 seats, a toilet, an Eberspacher pre-heater, a Bosch Professional Line entertainment package, a reversing buzzer and an Isri driver’s seat. It is powered by a Paccar DAF MX11.320 Euro6 engine matched to a ZF EcoLife transmission. The other vehicle to be displayed by Arriva will be a tri-axle Van Hool TX17 Astron, powered by a Paccar DAF MX13 340 Euro6 engine matched to a ZF AS-Tronic gearbox. Specifications include a Sutrak air conditioning system, a Webasto Thermo 300S pre-heater, a sunken toilet, Tarabus Galaxy floor covering, 59 Grand Luxe TX seats and a Bosch Professional Line multimedia system. Making its first ever appearance at a show or rally will be the new Sunsundegui SB3 bodied Volvo B8R, which will be displayed by Volvo Bus and Coach. The 12m coach is fitted with 72 seats in three plus two configuration, which the dealership believes makes it an all purpose vehicle. Representing Volvo will be Retail Bus and Coach Managers Bob McGary and Phil Hudson. BASE will be represented in the rally by Holmeswood Coaches with a Mobipeople Midi Explorer 9.1m coach based on the MAN TGL 10.180 with Euro6 engine. It has 34 seats, an air conditioning system and double glazing. On their exhibition stand, BASE Coach Sales will have another three vehicles. In Holmeswood livery will be a Barbi Galileo HDH 13.8m based on the MAN RR4 chassis. Powered by a 480bhp Euro6 engine coupled with a ZF AS-Tronic gearbox, it has 61 seats, a centre sunken toilet, a DVD player, an air conditioning system and a wheelchair space. BASE will be bringing a 12.5m Mobipeople Explorer on the MAN RR8 chassis. The stock vehicle has a 360bhp Euro6 engine coupled to a ZF automatic transmission, 57 seats, an air conditioning system and double glazing. In Anthonys Travel livery will be a Barbi Galileo HDL 12.4m coach based on the MAN RR2 chassis with 360bhp Euro6 engine matched to a ZF automatic gearbox. Its specification includes 49 seats, a centre sunken toilet, a DVD player, an air conditioning system, double glazing and four wheelchair spaces. A 13.2m Neoplan Tourliner P20 will be displayed by MAN Truck and Bus. 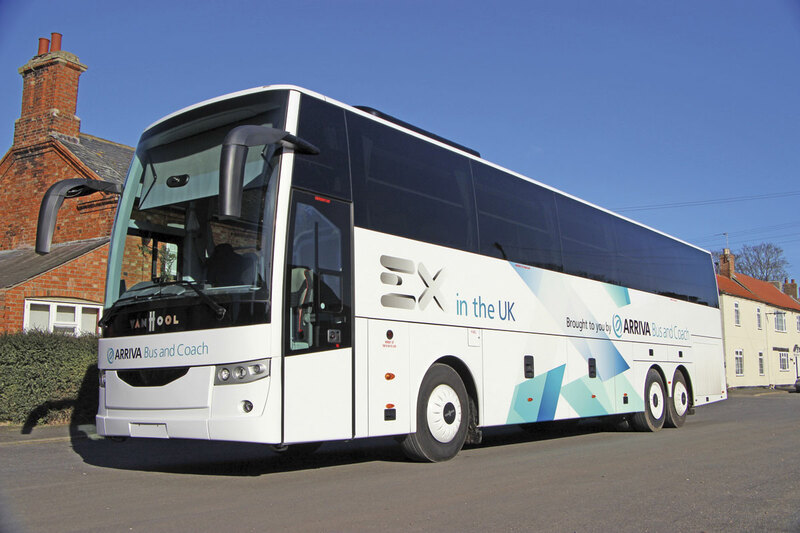 The coach is powered by a Euro6 turbo-charged six cylinder diesel engine matched to a ZF AS-Tronic 12-speed automatic Tipmatic transmission. It has a multimedia package, 53/55 Kiel 2010 seats, a dash mounted fridge, an air conditioning system, a centre sunken toilet, a servery, CCTV cameras and Wi-Fi. It comes with a 24 month up to 200,000km warranty. Scania is bringing a Touring to the rally. The Scania Touring comes as standard with a 13litre 410hp Euro6 SCR only engine. Safety features include ABS, Adaptive Cruise Control, Advanced Emergency Braking, Electronic Stability Programme and lane departure warning. It is also specified with a reversing camera and Xenon headlights. Four vehicles are set to be displayed by Moseley in the South, including a 13.2m MAN RR4 Beulas Glory. With power from a 12.4litre 480bhp Euro6 engine coupled to AS-Tronic transmission with intarder, the coach has 59 Sege BC V.I.P seats with leather wings, seat back tables, magazine nets, a wheelchair access ramp and fixings for one wheelchair. It also has a centre sunken water flush toilet, an air conditioning system, a Webasto pre-heater, an entertainment package, Wi-Fi, an eight camera CCTV system, rear out-swing and reverse cameras and USB charge points. The second vehicle will be a 12.9m VDL Futura FHD2 129.365MX with a 10.8litre Paccar DAF MX11 Euro6 370bhp engine matched to ZF EcoLife transmission. Its specification includes 57 Vogel Conturo seats, an air conditioning system, a Webasto pre-heater, a centre sunken toilet, a fridge, a water boiler, a CCTV system, a 3000w inverter, a vacuum cleaner, a reversing camera and an entertainment package. The other two vehicles are a 13.2m Van Hool TX16 ACRON and an Iveco 70C17 Sitcar Voyager. Powered by a Paccar DAF MX Euro6 440bhp engine with ZF AS-Tronic transmission, the Van Hool has 53 Grand Luxe seats, an air conditioning system, Webasto heating, a multimedia package, a centre sunken toilet, a fridge, a water boiler, a continental exit with powered door and reverse and surveillance cameras. The Voyager has an Iveco Euro6 170bhp engine with a manual six-speed transmission, 25 Reclining seats, an air conditioning system, a powered entrance door and an entertainment package. Moseley in the South and Moseley PCV will have a full sales team attending the rally on both days. Irizar UK will be at the rally with two i6 integrals. One will be a 13.2m tri-axle with 53 i6 Lux slide-out seats incorporating iLeather panels and headrests, a Paccar DAF MX13-340 462bhp engine matched to a ZF AS-Tronic automated gearbox, wood effect flooring, a Bosch Professional Line audio centre and the Azimut satellite Wi-Fi media system. The second will be a 12.2m 49 seat tourer, powered by a Paccar DAF MX11 369bhp engine through a ZF EcoLife automatic gearbox. Plaxton will be bringing its big cats to the Rally. On display will be a Cheetah in York Pullman livery, the second they have had in recent months. Powered by a 230bhp engine, it has 36 seats, an entrance mounted crew seat and a polished stainless steel finish throughout. This will be joined by a Panther based on the Volvo B8R chassis, one of the manufacturer’s demo vehicles. The coach has a centre toilet, an integral servery, 53 seats Brusa seats in moquette, adjustable footrests, magazine nets and a Bosch Classic entertainment package. Plaxton will also be providing the Rally organiser’s with a 12.8m Volvo B8R based Leopard with 59 seats to assist with the show set up. Once this duty is finished, it will be put on display. The Leopard and the Panther will be in ‘Best of British’ branding. The Rally is sponsored by Arthur J. Gallagher and LTCOA (London Tourist Coach Operators Association).